During unsettled or troubling times, Mahler can seem like a spiritual balm, and the Royal Concertgebouw Orchestra's performance of the composer's mighty Symphony No. 5 at Carnegie Hall on Wednesday, November 30, seemed particularly well timed. Mahler's towering, seventy-minute masterwork almost seems like it's three different symphonic worlds. The first two movements are the spiritual heart of the piece, with their mutually resonating and occasionally intertwining funeral marches. The third movement--at twenty minutes, the longest of the five--is a playful, succession of mostly upbeat waltzes. The fourth movement is the well-known, soulful "Adagietto," written as a love song to Mahler's soon-to-be wife, Alma. The concluding "Rondo: Finale" reasserts the sunny radiance of the third movement in a series of contrapuntally dazzling episodes. The famous C# minor trumpet call that opens the piece was rendered impeccably by Miroslav Petkov, who performed this and the piece's many other solo passages with the eloquence of a great storyteller. Conductor Semyon Bychkov then proceeded with a thoughtful, deliberately paced account of the piece's exquisite and profound opening theme. Only a few bars in, it already seemed like a sacred event. Bychkov's approach was reverent without being indulgent, as if he wanted to wring every drop of beauty out of the score; his scrupulous attention to inner voices brought forth lines I'd never heard before. The furious eruption at the beginning of the second movement was hair-raising, and the slow, mournful reprise of the funeral march in the cellos was heartstopping. When the full string section took up the theme near the end, it was like being at sea during a savage tempest. The long third movement can seem amorphous, but Bychko's ear for detail and the orchestra's precision made it difficult for the mind to wander. In the slower middle section, the musicians played their hearts out with a sense of personal involvement sometimes missing from American orchestras, and the movement's finale was full of bravura and excitement. The strings were opulent and enveloping in the "Adagietto," then shimmeringly soft. The fifth movement provided a welcome display of orchestral punch and snap. The ensemble playing veered off only slightly on occasion during one of the brisk fugal passages, but it can be difficult for players to hear each other across the vast Carnegie stage. All in all, the piece's large-scale progression from the almost painful melancholy of the first two movements to the exuberant celebration of the last had a palpably colossal impact in this memorable performance. Although a Mahler symphony is always going to be the main event, the twenty-minute piece that formed the concert's first half, Detlev Glanert's Theatrum bestiarum, Songs and Dances for Large Orchestra, was plenty eventful itself. After a hugely cacophonous opening chord, a growling melody for bass and muted tuba plays out against shivery interjections from upper-register violins. Subsequently, we are treated to an ongoing series of sporadic riffs and bracing orchestral sonorities that erupt into a wild funhouse ride. Glanert's treatment of his massive instrumental forces is wizardly, and the piece came off as one terrific orchestral effect after another. It almost spoiled the fun to read in the program notes that Glanert intended the piece to depict a visit to "a zoo of human beings," and that it's a "powerful symphonic commentary on inhumanity in our time." Well, there's no disputing that humans can sometimes act like animals, and the piece does have a disturbing undertone that surfaces periodically, but without the context, it emerges as a smorgasbord of the best kind of orchestral modernism, much of it very cinematic. Somewhere toward the middle, a gleefully dissonant organ chord comes smashing through the texture and cuts everything off, leading to back-and-forth between the organ and spectral echoes from the rest of the orchestra. In the concluding passage, the quiet, lush playing of a string quartet emerges from a series of slicing orchestral chords, as if a plaintive voice of humanity has broken through the harshness. This was the somber yet optimistic conclusion as the quartet faded to nothingness. The bows at the end of the concert were almost a show in themselves. 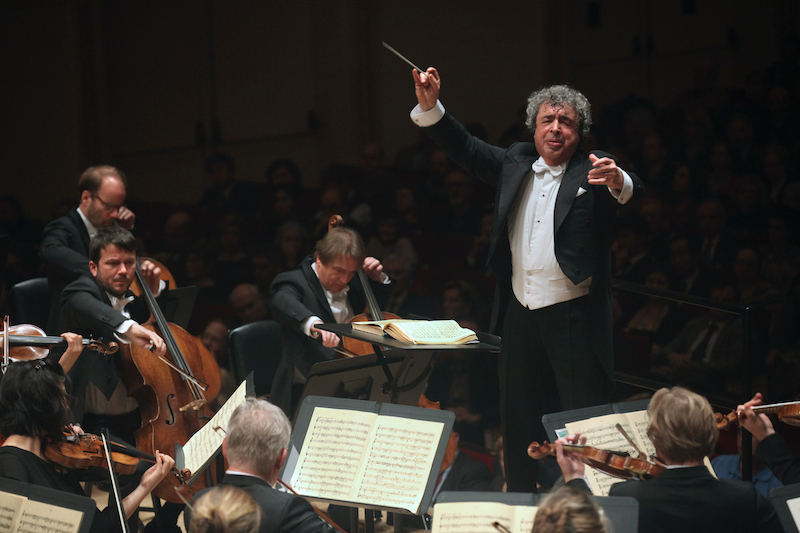 Bychkov, who conducted the entire concert from memory, not only acknowledged the soloists but actually traversed the entire orchestra to embrace each one personally, including a trip all the way back to the bass section. It was virtuoso milking of the applause, which the roaring, standing ovation crowd was happy to provide. The Royal Concertgebouw Orchestra in concert on November 30, 2016 at Carnegie Hall. Conductor Semyon Bychkov.